The new Doctor Who TARDIS interior revealed! The BBC has been teasing a new Doctor Who TARDIS interior (flashing glimpses of the new, Gallifreyan inscribed ceiling) and hinting at big changes. 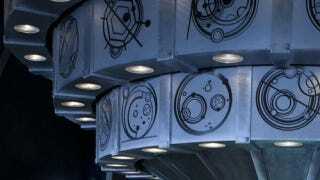 But now (almost) all of the new TARDIS interior has been revealed. Warning, spoilers! Behold the magnificent, sleek new look for the 11th's Doctor's TARDIS. Gone away is the clear floor and TARDIS bits hanging from the wall. In its place is an almost minimalist TARDIS look - simple walls, cement floor, and the main control panel. Looks a bit similar to the 5th Doctor's TARDIS. Created by production designer Michael Pickwoad, we hungrily await the eventual video walk through (we assume) he'll give after the airing of the Doctor Who Christmas Special. How do you like the TARDIS' new look?